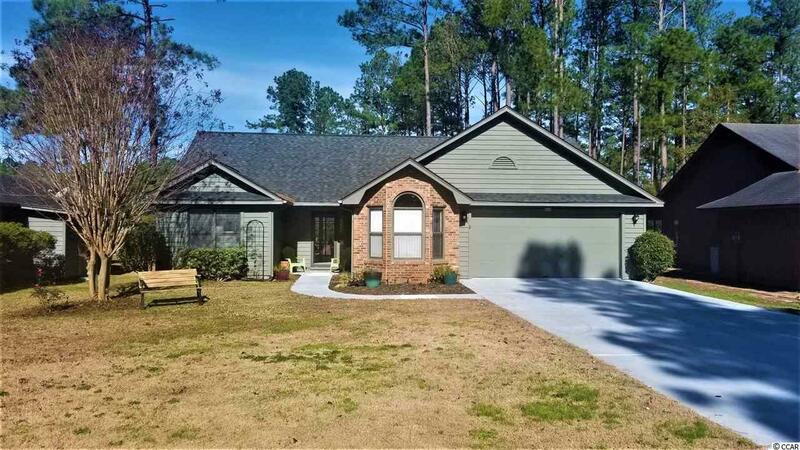 55 Plus Neighborhood , Must See Turnkey Stunning HOME with 3 BEDRooms , 2 BATH , 2 car garage in Myrtle Trace - active age 55+ active community.! Cathedral ceiling LR: sliding glass doors on either side of fireplace. Executive Laminate hardwood floors thru-out. Step out of living room to spacious patio & Bar-B-Que grill that will convey. Kitchen has farm sink, stainless steel subway tile backslash , 12 floating shelves, granite counter top, 2 pantry's, french door refrig, smooth cook-top. vaulted ceiling. Farm sliding Doors in Master bedroom and tray ceilings . Master Bath: open shelving, 2 stainless vessel sinks, pebbled tile on shower floor & vanity top, Italian faucets, porcelain rectified tile on floor. There is a pocket door from LR to guest bedroom. Murphy Bed in front guest bedroom. Garage Refrig conveys. NEWER: Floors, dryer, heat pump, roof, hot water heater. Exterior & garage floored painted, driveway refinished. 6 kitchen wall baskets do not convey. YES, LAND COMES WITH THE HOME. MYRTLE TRACE HOA FEE IS VERY LOW and taxes are extremely low compared to up North. Close to Carolina Forest , Aldi, Publix , Food Lion, Krogers, Walmart, Conway Medical Center, Dining, Lowes Home Improvement and much more. The age 55+ community has many activities including potluck dinners, movie nite, bocce ball, domino's , basketball , shuffleboard, horseshoes, line dancing, poker, scrabble , canasta, bridge , mah jongg, game night, bingo , chorus, garden club, ice cream socials & holiday parties.. Exterior of home painted, driveway resurfaced in 2018. Directions: From Beach On 501, Left At Burning Ridge, Left At Myrtle Trace, Right On Laurelwood. From Beach On 544, Right On Singleton Ridge, Right On Myrtle Trace, Right On Laurelwood. Do Not Go On Gated Myrtle Ridge Road.